PEBBLE BEACH, Calif. – May 16, 2016 – The Automotive Fine Arts Society (AFAS) will return to the Pebble Beach Concours d’Elegance® with a selection of their best automotive artwork on Sunday, Aug. 21. Sponsored by The Lincoln Motor Company, the 2016 AFAS exhibit at The Lodge at Pebble Beach in beautiful Pebble Beach, California, will showcase the latest creations from the world’s finest automotive artists. Established in 1950, the Pebble Beach Concours d’Elegance has grown to become the finest exhibition of show cars in the world. Held each August on the 18th fairway, the Pebble Beach Concours d’Elegance is an annual gathering of rare and antique automobiles, world famous artists and international automotive enthusiasts from around the globe. The 2016 Pebble Beach Concours d’Elegance will feature several marques and special classes including Delahaye, BMW’s Centennial, 50th Anniversary of Ford GT40 victory at Le Mans and Bizzarrini. Additional AFAS guests attending this year’s Pebble Beach Concours d’Elegance include guest artists Toshiharu Inagaki, Makoto Ouchi, Akira Watanabe, Kenji Yamada, Sandrine Blondel and Dan McCrary, Robert E. Larivee – Author of “Hot Red Detroit” and the Art Center College of Design. One of the art pieces on display at this year’s show is Jay Koka’s newest work, entitled “918 on Ocean”. It depicts a Porsche 918 on Ocean Avenue in Carmel during Car Week. 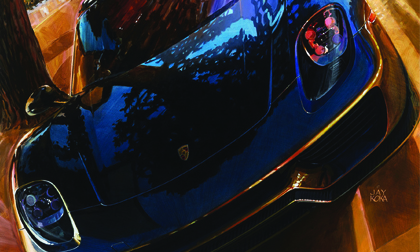 Known for his ability to manipulate color and mood to create automotive masterpieces, Koka’s art has been featured at several international events over the years including the Pebble Beach Concours. Along with the exhibit on Sunday, AFAS will also host an exclusive invitation-only reception sponsored by The Lincoln Motor Company on Saturday, Aug. 20. This event has become a popular destination for celebrities and industry leaders to preview the latest AFAS pieces. Created in 1983 by six artists the society made its first appearance as a group at the 1986 Pebble Beach Concours d’ Elegance. Still very much involved with the Pebble Beach , AFAS is comprised of more than 25 members who demonstrate talent, innovation and an undeniable passion for automobiles. Pebble Beach®, Pebble Beach Resorts®, Pebble Beach Golf Links®, Pebble Beach Concours d’Elegance®, Pebble Beach Tour d’Elegance®, and The Lodge at Pebble Beach™ are trademarks, service marks and trade dress of Pebble Beach Company. All rights reserved.